The loss of a significant other is more common in children than one would expect. Whether death is due to trauma or a long-term illness of a parent, sibling, or close relative, the impact on the child can be a wrenching experience that alters their view of the world forever. "One out of every 20 American children under age 15 loses one or both parents due to death" (Steen, 1998, p.54). It is estimated that in a secondary school of 800 pupils, 24 children will experience a death of a family member (Kmietowicz, 2000). Death of a sibling profoundly affects children, and its repercussions can be with the child throughout life. Although divorce is different than an actual death experience, this type of loss often mimics the severity of pain a child feels when a parent dies. Many children have difficulty articulating their feelings and needs. Nurses and other health care professionals working with bereaved children can help to soften the emotional blow, support the expression of their feelings, and work through problem areas. Problems not adequately addressed can become sources for added difficulties in adulthood, including psychiatric difficulties (Dowdney et al., 1999; Naierman, 1997). This article will explore how children deal with loss and interventions nurses can recommend to family members. In searching for ways to reach out to bereaved children, it is necessary to understand how children conceptualize death. Their mental age has a major impact on their understanding of death. There are four general concepts involved in a child's understanding of death - universality, irreversibility, nonfunctionality, and causality (Doka, 1995). Throughout their development, children are challenged to realize the universality of death - that all things must die and that one can not avoid death or predict when death will happen. Children actually begin to develop a very crude awareness about death as early as infancy (Wolraich et al., 2000). A second concept is that of irreversibility. This concept confronts the notion of permanence, that once one dies, one can not come back to life. Children have difficulty understanding the third concept of non functionality, which is the concept that once a living thing is dead, all of its bodily functions cease. In the fourth concept of a child's perception of death, causality, the child is asked to understand what happens to bring about the death of a living person. The age groups are not meant to be exact, but rather a representation of the different developmental stages and their reactions to death. Infants and toddlers.The world of infants and toddlers is primarily filled with having their personal needs met. If a small child is not entrusted to another parent or caregiver providing strong support for their physiological needs, lots of nonverbal communication (i.e., hugging and rocking) and love, separation anxiety typically can occur (Seager & Spencer, 1996; Wolraich et al., 2000). In a more severe reaction, pathological problems can surface, such as detachment and regression (Seager & Spencer, 1996). Ages 2 to 6 years.Preschool children, age 2 to 6 years old, view death as reversible and temporary (Schaefer & Lyons, 1993). A commonplace belief among this age group is that death is "magical." Children believe a dead person can be awakened or be "put back together again" just like Humpty Dumpty. Often they will make inquiries about the dead such as, "When will grandma come to play again?" During these young ages, it is important that parents not pressure themselves to try to explain the finality of death. This concept is incomprehensible at this age. Play and art therapy and activities that allow children in this age group to reminisce about death help to support the emotions related to loss. Also, daily routines, structure, and affection are important at this time. Ages 6 to 9 years.By age 5 or 6, over half of all children have a full understanding that death is final and permanent, and by age 8 or 9, virtually all children understand this core concept (Sheldon, 1998). It remains a transitional time, however, in terms of comprehending the full concept of universality. Remnants of magical thinking exist, and these children may personify death, such as thinking the "bogey-man" has come to take a loved one to heaven. There is a tendency for these children to think they are at fault for their loved one's death. The child should be reassured that they did not cause the death. They may also try to identify with the dead or act-out being like that person. Ages 9 to 12 years.Although children in this age group grasp the concepts of death intellectually, the realization may be overwhelming. These children want factual information and are very curious about the "mechanics" of death; they want to know what physiologically happened to make the person die, what the person looked like, and what process the body goes through at burial. Children sometimes still believe that wishful thinking can lead to death or that their past behavior contributed to their loved one's death. They may view death as a punishment for these thoughts or actions (Seager & Spencer, 1996). Teenagers.As children become adolescents and become capable of abstract reasoning, they not only see death as final, inevitable, and irreversible, but they also begin to understand that they and their loved ones will die some day (DeMaso, Meyer, & Beasley, 1997). The teen years are marked by rapid change and compounded by peer pressure. It is a period of intense feelings, such as anger. Even though adolescents near adult levels of understanding death, they lack coping skills needed to process the death or they may act like death is a rumor, avoiding discussions about it. Sometimes teenagers attempt to defy death with unnecessary risk-taking, leading to inappropriate and nonproductive behaviors. Teenagers may attempt to dangerously cope with death through drug and alcohol abuse, promiscuity, reckless driving, or displaying impulsive-compulsive behaviors (Naierman, 1997). Sharing grief reactions with adults can be difficult since a main task in adolescence is separating from their families and establishing their own identities. Peer groups become important resources, particularly if the group includes someone who has experienced a similar loss. However, parent and adult support systems can help adolescents feel safe and supported and know that someone is available for them. There are certain types of deaths that create accelerated pain. These types of losses include sudden death; suicide; death due to murder, a school shooting, drunk driving, or a freak accident; or sibling death. Approximately three fourths of the more than 40,000 deaths that occur each year in the 10-24 year age range in the 'United States are related to motor-vehicle crashes (37%), homicide (14%), suicide (12%), and other injuries (e.g., drowning, poisoning, and burns) (12%) (Centers for Disease Control [CDC], 1993). Deaths of these magnitudes are difficult for children to manage because they lack the life experiences necessary to pull them through such tragedies. Additionally, boys are more affected than girls, and bereaved mothers tend to have more mental health difficulties in these situations (Dowdney et al., 1999). Children survivors of family suicide may blame themselves for being a poor son, daughter, or sibling (Evans, 1996). Deaths from senseless acts tend to cause terror in the surviving child, threatening their safety or creating doubt in the child's deep sense of justice and fairness. Sibling deaths, which until recently received little attention in the literature, can be extremely difficult. Grief symptoms of surviving siblings have been attributed to the emotional unavailability of parents, their lack of connectedness with the world after the loss of their sibling, and limited communication that can occur in families after the death (Gibbons, 1992; Martinson & Campos, 1991). Surviving children should be supported in whatever steps they need to take to feel better and whole again. These steps include counseling, which has been shown to be helpful (Black, 1996; 1998). For the older child, appropriate peer and outside support systems should be encouraged. Assisting children in the grieving process starts as soon as it is apparent that a significant other may die. Research has shown that children who have been told about the impending death of a loved one, who are encouraged to ask questions and express feelings, and who are included in the caregiving tasks cope more successfully than children without this knowledge and opportunity (Sahler, 2000). Doka (1995) states that talking to children about death and serious illness is too important to be left to a crisis. Opportunities such as watching leaves bud, color, and fall or reading the story "Charlotte's Web" introduce the concept of death or help a child cope with loss. Watching a video like "The Lion King," where a child may act out their sadness with Simba, is a good example of how a child can express grief in a safe and appropriate way (Kelly, 2001). Experiences with dying animals and plants will lead to the recognition of the life cycle (Rudolph, 1978). Teaching that death is part of the process of living enables the child to view death as a natural part of life (Doka, 1995). The goal is to help the child through the grief, not around it, and not to deny it (Doka, 1995; Kelly, 2001; Wolraich et al., 2000). A review of the literature recommends that death be explained to children in a simple, clear, honest manner, but not overly detailed. Use language that is appropriate to their age and developmental understanding of death. The younger the child, the simpler the explanation. Don't be afraid to let children see you grieve, for this gives them permission to be sad as well. Children should be encouraged to verbalize or demonstrate how they feel, what they are thinking, and what they know about the death. Children will ask what they want to know and what they can handle. Encourage questions and make it clear to the child that you are available for them. Participation in a funeral helps a child understand the finality of death and dispels the fantasies of their imaginative minds (Doka, 1995). Parents should ask children if they want to go and then prepare them for the event if they decide to attend. Children should not be forced to go. The child's presence at the death, seeing the body afterwards, and attending the funeral are all helpful as long as the child chooses to go and is prepared (Sheldon, 1998; Wolraich et al., 2000). When death happens, tell the child about it immediately. A close relative (preferably a parent) or friend of the family should tell the child in familiar surroundings (preferably at home). Stay close to the child; hug and touch. Reassure the child that they did not cause the death nor could they have prevented the death and they can not bring the person back to life. Reassure the child that they are loved and will continue to be cared for. Share feelings and memories with the child; this helps reduce their sense of isolation. Let the child see you grieve; it gives them permission to grieve. Express your own feelings; this is a powerful way of opening the door to the child's grief. Explain what death means to you. Encourage questions and be available to answer them. Grieving children need to tell their stories over and over again; listen. 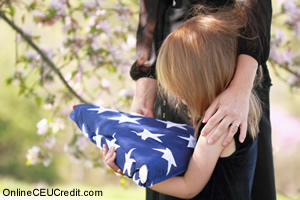 Grieving children need to say the name of the dead loved one; allow them. Reminisce about the dead loved one. Allow extra playtime; this is a great stress reliever. Encourage them to grieve in their own way. Acknowledge their right not to talk. Encourage group counseling, particularly in an environment where their peers are part of the process. Group counseling allows teens to legitimize their feelings and see that others have the same types of feelings. They learn ways to express their feelings in ways that can help them cope. It is hoped that the group process will assist them to realize that their feelings do matter and that someone else cares about what they are experiencing. - Busch, T & CS Kimble, Grieving children: are we meeting the challenge? Pediatric Nursing, Jul-Aug 2001, Vol. 27, Issue 4. The preceding section contained information about grieving children’s concepts of death. Write three case study examples regarding how you might use the content of this section in your practice. According to Busch and Kimble, which of the three concepts of death do children have the most difficulty understanding? Record the letter of the correct answer in the CEU Answer Booklet.